Just because you may have dentures does not mean that you can ignore your oral health and hygiene. It is still important to seek regular dental services for evaluating the soft tissues and to examine the denture for proper fit, comfort, and function. Why should I clean my denture daily? How do I keep my dentures clean? Rinse the denture under water after meals to remove loose food debris. Brush regularly after each meal, or at least before bed. This removes the plaque and some stains. Brush with water, soap, or a mildly abrasive toothpaste, or denture paste. Scouring powders or other abrasive cleaners should not be used because they scratch the denture. Scratches make the denture more susceptible to collecting debris, plaque and stain. You can use a denture brush or a regular soft toothbrush to clean the denture, but use a separate brush for cleaning any natural teeth you have. Make sure you reach all areas of the denture. The denture can be soaked in a solvent (such as Efferdent, Polident) or a detergent with a chemical action that removes or loosens light stains and deposits. Rinse the denture with water afterwards. Chemical immersions can be done daily or several times a week. Ultrasonic cleaning is done during a dental appointment to remove heavy stain and calculus (tartar). The most effective way to keep your dentures clean is by daily brushing, in combination with soaking the dentures in a chemical solution. When brushing the appliance do not hold it firmly or with pressure as this can break the denture. Clean the denture over a sink half filled with water and place a towel in the sink to act as a cushion in case the denture should drop. Do not soak or rinse the denture in hot water, this can distort the shape and fit of the denture. Never scrape the denture with sharp instruments in an attempt to remove hard deposits. Instead, take it to a dental professional for them to clean. Make sure to leave your denture out overnight, or out of the mouth for a period of 6 to 8 hours daily. Wearing them at all times without allowing your gums a chance "to breathe" can result in infections of the soft tissues under the denture. Not only do your dentures need maintenance, but care also needs to be given to the tissues under your denture. The gums should be cleaned daily with a soft toothbrush or a washcloth. This removes the plaque and debris on the gums. It also massages and stimulates circulation of tissues. Massage your gums by placing the thumb and index finger over the ridge and use a "press-and-release" stroke. It is very important to keep any remaining natural teeth free of plaque. How do I know my dentures no longer fit? With age, the jaw bones slowly change. Therefore, dentures may not fit forever. 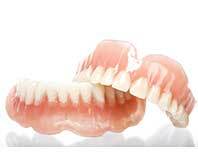 You may need to have your dentures re-adjusted or you may need to have a new denture made. If you encounter any of these problems, let us know.